SL7606, .375" Wide Stainless Steel Manual Bag Sealer & Cutter. By START International. The START International SL7606 Stainless Steel Manual Bag Sealer with Cutter easily places a flag of tape around the bundled end of a bag. The dispenser automatically measures and cuts tape when the bag is inserted. 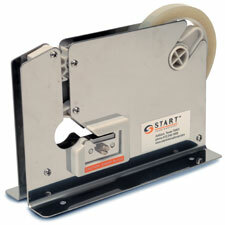 This unit works well with most thin polyester or reinforced paper tapes. The all-metal construction and pre-drilled holes in the base (for easy workbench mounting) ensure stability during use. Includes integrated bag cutter.